Sometimes, new really is better. Sometimes, new really is better. www.apexfa.com info@apexfa.com 888-323-4555 SJ printers offer features that competitors simply cannot match: On Board 3D SPI with True Closed Loop Control - Print quality up – re-work costs down - Single User interface Big board capability - Have big boards, or LED's and no printer? 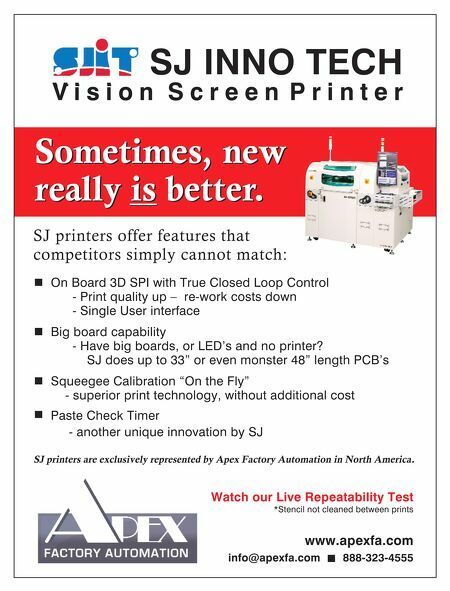 SJ does up to 33" or even monster 48" length PCB's Squeegee Calibration "On the Fly" - superior print technology, without additional cost Paste Check Timer - another unique innovation by SJ SJ INNO TECH V i s i o n S c r e e n P r i n t e r Watch our Live Repeatability Test *Stencil not cleaned between prints SJ printers are exclusively represented by Apex Factory Automation in North America. Show Preview — Free Keynote Addresses All Three Days! Show Preview — Professional Development Courses, The PCB List, Real Time With.. Column — What is Your Real Output?